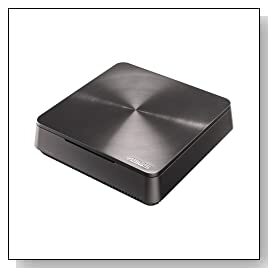 Metallic gray VivoPC VM60-G067R is the new mini desktop PC by Asus with an Ivy Bridge Intel i3 processor, good amounts of memory and hard drive that make it suitable for work and entertainment- both space saving and functional. It is as portable as a laptop without compromising on power. ASUS VivoPC comes with a 3rd generation Intel Core i3-3217U processor at 1.8 GHz (cache), 4GB DDR3 SDRAM that can be expanded up to 16GB, 500 GB Serial ATA hard drive at 7200 rpm rotating speed and the 64-bit version of Windows 8.1 operating system. It has a slide-out cover that makes it easy for you to have access inside to upgrade the hard drive and memory. The i3 processor with 4 GB RAM is quite the performer for anything other than the demanding multimedia editing or engineering programs or the most advanced games at high settings, and it gives you the ability to run a few programs at the same time. 500 GB is sufficient storage space for a lot of photos, songs, videos and it operates at a higher spindle speed than regular hard drives. You'll get 3 years of 32GB cloud based Asus WebStorage for free to enable you to have access to your more important files wherever there is internet connection. The Intel HD 4000 graphics card offers good quality graphics for nice images with fine details and vibrant colors. And for decent sound from such a small machine, you have Asus SonicMaster and MaxxAudio as well as double built-in 2W speakers. Wi-Fi GO technology allows you to use your smart phone like a remote device and have access to your PC screen through your cell phone or tablet screen. You'll see the stylish spun-metal design that is available on other Asus PCs and it is kind of a nice reflection of the quality of hardware and components used by Asus. It is highly portable at only 2.6 lbs weight and dimensions of 7.5 x 2.2 x 7.5 inches (only 2.2 inch thin)- very small desktop footprint and with its VESA mountable design you can put it behind a suitable monitor. You'll find a USB keyboard and mouse included in the package. 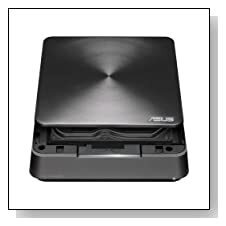 ASUS VivoPC doesn't have an optical drive but most of the other connectivity options or ports are covered: 2 x USB 3.0 ports for fast device charge and transfers of data, 4 x USB 2.0 ports, 802.11a/b/g/n/ac Wi-Fi wireless, Bluetooth 4.0 to connect to other Bluetooth enabled cell phones, printers etc., 10/100/1000Mbps Gigabit Ethernet with RJ 45, an HDMI port, a VGA port, a 2-in-1 Media Card Reader, 3 x Analog audio ports, 1x SD flash media slot , 1x MMC, an S/PDIF Output Line Input (1/8 inch), Microphone Input (1/8 inch), Speaker Output (1/8 inch), Kensington security lock, USB keyboard and mouse. Conclusion: Asus VivoPC VM60-G067R is the less expensive version of the VM60-G072R model with a different processor (i3 instead of i5) and less amount of storage (500GB instead of 1TB), with everything else pretty much the same. It is quite a powerful PC despite its size which makes it easy to be taken anywhere with less weight and size than standard 15.6 inch laptops. It comes with great useful features and connectivity options to make it easy to use on a day-to-day basis. Cons to point out may be the Windows 8.1 OS and not having a DVD drive (As you'd expect on a desktop) but when was the last time you used a DVD drive, and the lack of it also contributes to its compact size. Great value mini desktop PC!